Namati is an international organization that tests the potential of legal empowerment through innovative interventions and research. Through our work, we seek a better understanding of the impacts of legal empowerment and the most effective mechanisms for achieving them. 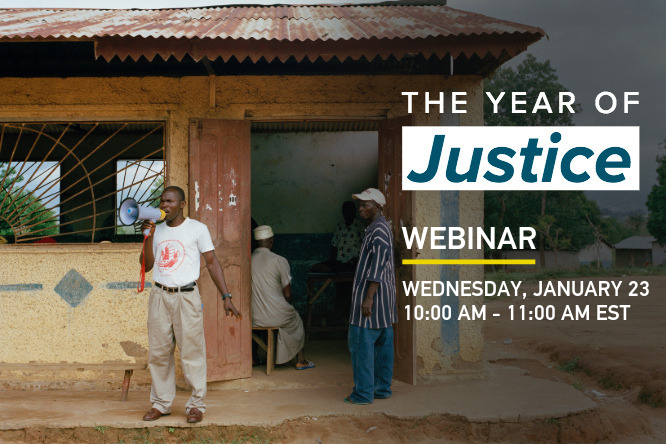 Join our upcoming webinar to learn how we can advance justice for all in 2019. Our movement made history when we squeezed justice into the Sustainable Development Goals, adopted by world leaders in 2015. But in the years since, governments have done almost nothing to make good on their promise to achieve “access to justice for all.” Instead, justice is backsliding in many places. In a forthcoming policy brief, out later this month, our community argues that two critical challenges—the financing and protection of grassroots justice defenders—are essential for making progress on justice. During the webinar we’ll discuss recommendations in the brief about how governments, donors, and multilateral institutions can protect and invest in justice defenders. We’ll also discuss how we can use key moments in 2019 to advance the work of justice defenders in our respective countries and across the globe. Let’s make history once again. Let’s ensure world leaders hear our collective voice once again.